Are your players ready for the zombie invasion? Did you sit on the sidelines? Did you watch as your world changed? … it is your world no longer. 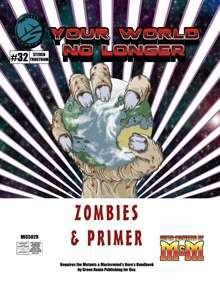 Your World No Longer is a series of Super-Powered by M&M product intended to supply Gamemasters with packaged campaign details and ideas for stories involving global conquest and invasion. Each release outlines a separate scenario wherein a particular foe has mastered the world, providing information on how and why Earth was dominated, and how the world's heroes and villains responded. The details provided are sufficient to allow the Gamemaster to run the game quickly and off-the-cuff, but remain open enough to permit further development (indeed, this is encouraged.) This open design format also allows the scenario to be used in just about any setting, be it one that's been published or one entirely of the Gamemaster's own devising. The world is no longer yours but it is up to you to take it back. Show us what you're made of and resist! The first release includes the primer material that will apply to running all future releases, as well as details for running a zombie apocalypse in your super-hero campaign. Expanding on the content provided in The Manual of Mutants & Monsters: Infected Zombie, you get the basic (clarified) infected zombie template and the zombie Uh Huh, zombie attack dog, zombie rat, and zombie rat swarm stat blocks. There is also a special infected lasher zombie template with a lasher scientist example, the blob zombie template and blob zombie Uh Huh, and stalker zombie template and stalker zombie thug. Lastly, there is the intelligent infected zombie template detailing what happens if the zombies retain their intelligence and personalities, along with the intelligent zombie paragon example. Rounding out this product are three caper ideas for using infected zombies in your game, suggestions on how the zombie infection may function in your game, and 4 new extras and 2 new flaws. The new extras and flaws will also appear in either Better Mousetrap 3e or Metahuman Martial Arts 3e upon their release.